Men who have a college degree are far more likely to delay parenthood than men who are less educated, according to a new Pew Research Center analysis of data from the National Center for Health Statistics. 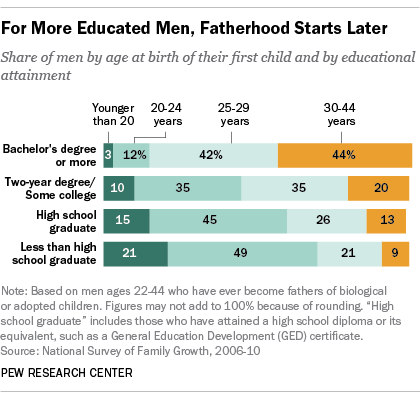 Among dads ages 22 to 44, 70% of those with less than a high school diploma say they fathered their first child before the age of 25. By comparison, less than half (45%) of fathers with some college experience became dads by that age. The likelihood of becoming a young father plummets for those with a bachelor’s degree or more: Just 14% had their first child prior to age 25. Like men, women with more education are likely to be older when they become mothers. However, men are less likely than women to become parents at all. 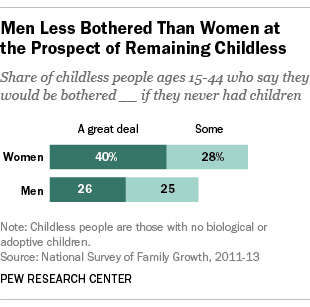 While about 55% of men ages 15 to 44 (the age for which data are available) are childless, this share is 44% for women. And among men ages 40 to 44, and presumably nearing the end of when they are likely to become fathers, the share that were childless was 24%, compared with 15% of women in that age group. Discussions about having kids often focus on women’s desires and concerns. But the survey found that about half of men ages 15 to 44 who don’t have kids express at least some concern about going through life without the experience of being a father. By comparison, almost seven-in-ten childless women say the same. And while 29% of men who don’t have children say they would not be bothered at all if they didn’t have children, just 19% of childless women say the same. These findings are revealing, but they need to be viewed somewhat cautiously. The numbers come from the National Survey of Family Growth (NSFG), which is perhaps the most comprehensive source of data on the fertility patterns of U.S. men – but it has limitations. One comprehensive analysis of the NSFG suggested that it underreported about 20% of births to young men, and was especially likely to miss births to unmarried fathers. An important reason could be that the survey asks people not just about recent events but about those in the past. This may create more reporting problems for men than for women, because fathers are more likely to be living apart from their children than moms, and in some cases, dads may not be aware that they have fathered children. Although imperfect, the NSFG is one of the few sources that asks both women and men about their fertility. The major sources of U.S. fertility data are the American Community Survey (ACS) and the Current Population Survey (CPS), which only ask women about their births. Vital statistics data based on state birth certificates are another important source of information on births. However, while birth certificates do request information on the characteristics of fathers, this information frequently is left blank, especially when the parents are not married. For instance, in 2013, 19% of records lacked data on father’s race, and 13% lacked data on father’s age. As a result, information on fathers is often missing from the vital statistics data.